1. Roy Blackwell The following site has a recording of Roy Blackwell's memoir who was evacuated to a house next to the Bell in Henham and then Elsenham during the war. 2. ARTHUR & JOHN CHRISTY - We are very grateful to David Christy who has sent us the recollections of his father Arthur Christy and Arthur's brother John when they became WW2 child evacuees here in Henham. On Sunday the 3rd September 1939 Dad took us, my brother John 7, and me Arthur 10, to Kings Road School, Chingford where we were put on London Transport buses, along with lots of our school friends. After travelling for hours we eventually arrived in Henham. John and I, were allocated to Mr & Mrs Timmins of 'Bays Cottage'. In the new year (1940) we moved to 'Woodstock', a bungalow in Henham with Mr Albert Salmon & Mrs Doris Salmon. We enjoyed our new country life. Mr Salmon had a big garden and grew vegetables and kept chickens. He also taught us about bird life as the war was hotting up by now. The villagers were digging air raid shelters on the village green. Then one afternoon in August (I think it was) we heard a lot of aircraft. When we looked up we saw a large formation of bombers and fighters. They dropped some bombs and continued on their way. Two days later we were collected and were back in Chingford. These are the memories of John and Arthur Christy. Now resident in Norfolk. 3. Our thanks to JOYCE SMITH (nee WILLETT) for her memory. My memories of war time Henham are very sketchy as I was only 2 or 3 years old. and I don't actually know how long my mother and I were there. At the beginning of the War my parents lived in Islington, London, so my mother and I (just a baby) were evacuated to North Yorkshire. However, my mother was not happy there so it was decided that as Henham was my grandfather's village we would go to stay with a Mr and Mrs Snow who lived in Church Street. My great uncle Albert also lodged with them. Although I was only two or three years old I can remember the cottage vividly; the very high brass bed with a feather mattress, the Well in the garden, which I believe was a communial garden with the adjacent cottages. The kitchen always seemed to be full of ladies making jam. A very elderly lady lived next door, a Mrs Smith, who was very kind to me. I would stand at the gate looking out for the small girl who lived across the road (the Chase). I had no toys to play with so was delighted when I was invited to play with her (unfortunately I cannot remember her name). There were a lot of Americans billeted in the village and one gave me a 'golly'. This was my pride and joy and you can imagine how upset I was when during a walk across the fields with my mother to take Mr Snow's and Uncle Albert's lunch at Parsonage Farm, the golly's trousers fell off, never to be found again. Another vivid memory was being taken to buy sweets in the shop opposite the school. My mother told me that my father's cousin owned the shop. (I have recently seen the remains of this shop which was really a summerhouse in a front garden, but I had no recollection of what it looked like). I remember seeing the children playing in the school playground and wishing that I could go to school, but my mother said that I was not old enough. When the attacks on the American Air Base started (Stansted) and I believe bombs were landing on the village, my mother decided we may as well go back to London. I visited Henham many times after the war, staying with my father's cousins, Albert and Doris Salmon but sadly they both died in the 1960s. Uncle Albert had died in 1947/8, so it was many years before I returned. Evacuation 3 September 1939, we all got off a London double-decker red bus we had arrived at Henham Village Hall. We were the evacuees from Kings Road School, Chingford. It was afternoon and we were given lemonade and buscuits. In order that my brother Laurie, two very young sister Joan and Joyce (Joan's story is below) and I could stay together we were taken in Mrs Bundy's car two and half miles to the Railway Cottages, North Hall, where we were billeted with Frank and Clara Barker. My sister Joyce 7 years old and I 6 six years old thought we were going on a day's outing with our two elder brothers Gerry (14) and Laurie (12). Our two brothers knew differently, we were being evacuated. The bus got lost on the way and we didn't make it to Henham until late afternoon. The kind people of Henham were waiting for us at the Village Hall with much needed drinkk and food for all of us. We four were the last two be chosen because Mum had said "you must stay together". The only place Mrs Bundy, the billeting officer could find for us was at North Hall in two cottages next door to each other. Gerry and Laurie were in with Mr and Mrs Barker and Joyce and I were next door with Mr and Mrs Nevile. It was 2.5 miles to school with a long hill (Hall Road) on the way and so, before Christmas, Joyce and I moved up into Henham with another Mr and Mrs Neville right opposite the village hall. I believe it is now called Bell Cottage - in those days the Bell Inn pub stood two doors away. It was a truly dreadful winter: At first we thought it was wonderful to be out with the snow falling on us, as we had never been allowed out in the snow at home. There we used to run and play with the snow our brothers left on the door mat when they came in and wiped their boots. But here in Henham we were out in it! The wind had blown the snow into drifts along the hedges and I fell into one and so found out what snow could be like. We slept on a lovely feather mattress, were kept clean and well fed. But we wanted to go home. Miss Kathleen Bannister was the Sunday School teacher and gave us a little patch in her garden for us to dig and care for. She allowed us to play in her garden and shelter in her old stables when it rained. I would like to pay tribute to all the kind people of Henham, who gave all the evacuees a home at that dreadful time. (Extract from Memories of Henham). 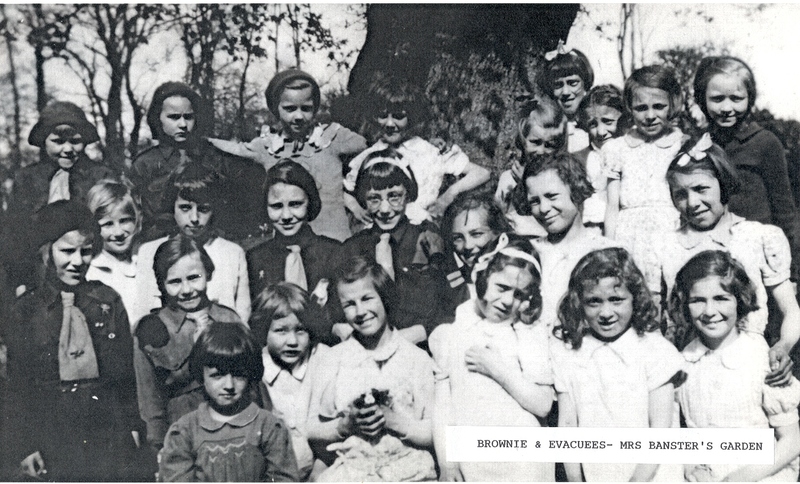 Brownies and Evacuees 1940/41 in Mrs Banster's garden. Back Row: Janet Mangold (E), Doreen Thompson (E), Joyce Sheppard (E), Celia Read (E), Joy Marshall, Nora Baynes, Anne Holloway (E), Doreen Neville (E), Joan Sheppard (E). Front Row: Pauline Camp, Marion Clark, Daphne Thorn, Stella Mangold (E), Freda Hollingsworth, Margaret Mussell, Barbara Blackwell, Sylvia Maguire (E).